Carnivorous Plants Website: Care, Plant Types, and Sources. Carnivorous plants are meat eating plants that need the nutrients from their natural growing conditions, like air, water and soil, to live as well as the nutrients from the insects and other bugs and arachnids that they consume. Carnivorous plants grow naturally in swampy areas around the world where the water that is constantly running over and below the ground washes the nutrients away in the soil. In order to get those missing nutrients, the plants have adapted and learned to eat the meat from the small animals that land on them. Some popular carnivorous plants that you can purchase and grow at home are venus fly traps, sundew plants, and pitcher plants. Prey must find its way to the trap, and is usually encouraged to do so by attractants fabricated by the plant. Prey must be captured by the plant. The prey must die while in the clutches of the plant. The prey must be digested. The nutrients from the prey must be assimilated by the plant. The Dionaea muscipula, more commonly known as the venus fly trap, is a carnivorous plant that looks like a big mouth with teeth that opens all the way up and just waits for an animal, like a spider or an insect, to land on it. 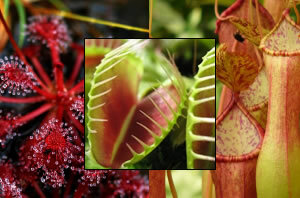 The mouth (trap) will then close around the prey and the plant will eat it. The way a venus fly trap captures its food is by waiting for a life form to land or crawl on the trap - twice. The trap won't close on the first landing because it isn't sure that it is an animal. It could have just been a leaf falling. But when it feels the animal again in a very short period of time, it will close in on the bug very quickly and begin the process of eating it. Venus fly traps can be found growing in the swamps of the Carolinas mostly, but have also been found in the Pine Barrons of New Jersey and in Northern Florida. The sundew, scientific name Drosera, looks like a beautiful flower or a very cool looking stem with dewdrops all over it, but the dewdrops are actually mucilage (like mucous) at the ends of the tentacles that it uses to trap its prey. The sundew preys on insects primarily, and wait for the insects to land on the inviting flowers. The insect gets stuck in the mucilage and then gets digested. There are about 170 different species of sundew plants in places like Africa, Venezuela and Australia. The pitcher plants come in all shapes and sizes, and grow around the world in different variations and species. The North American pitcher plant looks like a rolled up leaf forming a tube. Inside that tube is a gel substance that traps insects that make their way into the tube. Some species of pitcher plants have a fly paper type of trap rather than a tube trap, which is called a pitfall trap. Some pitcher plants look like flowers, some like stems, and some look like leaves. You can purchase these carnivorous plants online and have them delivered right to your home or office. They make a wonderful conversation piece, and some people even consider them a sort of a pet. No matter what you think of your carnivorous plant, you will think it is fun. © 2019 carnivorous--plants.com - All rights reserved.